Ìléra loògùn ọrọ̀ – Health is the medicine for wealth. Except if one lives in the rural area where walking around to execute daily duties is part of the life style, Nigeria also working its way steadily to nation of overweight – this is most noticeable in the cities amongst office workers. Our small towns is not spared, not when there is okada to transport folks from one end of the road to another with a small fee. What is not common among the general public is awareness to the importance of physical health as well as implication of poor physical health on well being. This is from Lagos Marathon earlier this month. It is nice to see ordinary people taking part in ‘free for all’ activities such as this. it is about awareness that staying active and fit is crucial to good health. During the last presidential election Mr Jonathan did not carry last: Obviously, given family photos posted online, physical fitness isn’t priority in these guy’s family however it is nice to see them trying to pass on message. Even down to my state of Osun, the state launched Walk to Live in the run up to elections last year. I thought that was fantastic. Obviously someone somewhere is hammering it in to our people that the era of ‘fat is beautiful’ is obsolete, being over weight shortens our lifespan. Hopefully, this trend will continue with less of Owanbe style and more of educating people on the benefits of staying active so it is easy to incorporate into daily routines. I was self-conscious a couple of years ago learning to swim and to cycle as sometimes I want to do something different from jogging. I had thought I would be the oldest person ever to learn to swim and cycle as adult – how wrong was I? Not swimming at the Olympic but learn enough that I no longer believe there’s Baba Olodo in the water to swallow me. Although wouldn’t be in Tour de France, but I know enough to add to the mix of exercise to keep me healthy and myths around Yoruba woman not cycling off my way. It is nice to know that whatever the age, with a bit of determination we can join in the fun to keep mind and body healthy. Traditionally, the bigger we are especially for women, the more beautiful we are supposed to be. Definition of beauty has changed – eating well and staying fit. Living healthily is worth all the efforts, apparently it comes with feeling and looking well too, those are added bonus. Its not just exercise.. Starches are a big problem.. And serving sizes..
That is a good point. And the proportion of our starch:protein/veg ratio is skewed the left. There are quite a few good things about African foods, but we need to cut down on palm and other oils.. And fatty cuts of meat,like lamb.. There are a lot of pulses and vegetables that have good health benefits like bitter leaf,ugu,okra and ogbono(so I hear!)! I actually believe most of our foods are nutritious and healthy when eaten in the right proportion and complimented rightly bearing in mind balanced meal. I know there’s hype about danger of palm oil being saturated fat and link to high cholesterol in recent years, yet more than 50% of food and household products on supermarket shelves all over the world contain palm oil – all in moderation, I’d say when adding to food directly. With pulses and veg. this is where significant number of Nigerians get their fibre and protein. With beans especially, we have about a dozen different types that can be made into different dishes – I suppose with more information floating around, folks will have to re assess and make informed decision. Yep! Caribbean food has similarities with some West African dishes.. We need to cut down on certain things,and possibly stop eating convenience food.. People don’t like to cook fresh food nowadays! That’s true re similarities with our dishes (not too surprising :)) I love your marinated meat! Agree, on the need to take it easy on convenience food too – too much preservatives and sugar. I was listening to a comment by Mohamed Farah (the Somali born Briton). He said when in Somalia he felt uncomfortable running and in some places it is unsafe. Does this apply to Nigeria, especially where kidnapping is on the rise? I know they have the Lagos marathon, I can’t imagine running in that humidity and pollution, but people do. But as you know Lagos is a one-off in Nigerian terms. I have run around my neighbourhood in the UK and in Australia in safety, all I had to do was keep an eye out for dog poo, or something equally nasty on the pavement, but if I were in Nigeria I’d have to think twice (if not thrice). In fact when I went to visit Canberra, it was not unusual to see ‘flocks’ of civil servants running along the clean tree lined streets during their lunch break. I was impressed. I’ve included a useful clip on fitness in Nigeria from Batta Box. Nigeria money, sexism and ethnicity seems to permeate everything we do … sigh. Mo Farah on safety concern while running – is that before or after he got famous? I would think unknown individuals running ‘jejeli’ on roadsides wouldn’t arose that much interest but the guy is famous now so he will likely feel same way in Lagos. Having said that, because Ife is a university town, we always have people especially Oyinbos running, thankfully now two affordable hotels in town close to campus have swimming pool that’s reasonably maintained. Re Mo Farah, it was after he became successful. I didn’t think it inspiring, no one likes to be left behind, so the fact that others are looking slim and trim and feel healthy will inevitably result in some individuals taking on those behaviours to achieve the same result. It’s a worldwide phenomenon. 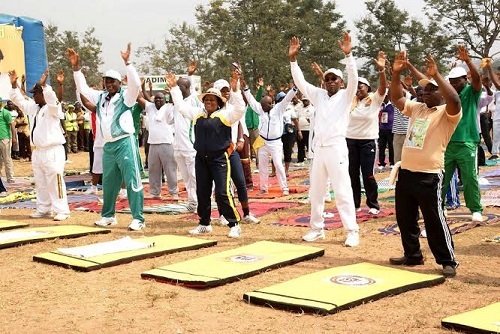 For most Nigerians, it is not about being trim or slim perse , it is more about the people understanding relationship between physical exercises and good health. For example, our side walks are terrible, if government is involved, then it means they will cautiously make room for pedestrians to walk safely. On food, it means NAFDAC will do their job by highlighting nutritional benefits of foods aired in TV. I see, thanks for making it clear to me. Haha, see Naija see wahala! Just watched this clip, what a show! Money, sexism and tribe – we have certainly got issues! You see, maybe one can use the term ‘Nigerianise’ wherever ethnicity, sexism and money are added when there is no need for it. Hi Fola, there is a French saying – “il faut qu’un bouger” meaning one has to move it. Confession: You have excelled in two things I’m yet to learn. I swim under-water and that’s no swimming for me. And I can’t get why I should sit on a two-wheel bicycle…I go fall! I attempted it o! And trust people kept saying there’s no way you will learn cycling without bruises and I no wan wound, so chapter end. Great call to action against Obesity. I’m on the round side (like they say) no I’m not just blessed in some areas. But watching my portions, time I eat and the kind of food plus not sitting all day is so helpful. With cycling, I ran out of excuses as it is in my face daily, so I scooted along when kids cycle. I had the best instructor ever who assured me I could do it that I only had to practise more. Falling down was not my biggest challenge, it was building up thigh muscle and God my bottom was sore for days before getting used to it and again I practice off road like twice a week – the feeling of freedom it gives is fantastic. You are absolutely right, even standing up and walk around a bit during the day does wonders to our body and mind. I love your style. I’m sure Imani and KE haven’t noticed that mum doesn’t swim as good as dad, if not I’ll be reciting the lyrics with them. The other day she said to me, “mum why are you wearing exercise clothes when you don’t even do exercise?” LOL. We will start a mother and daughter session soon. Great and hilarious post. I believe in lots of second chances and our health iservices truly the medicine to our wealth. I loved the opening quote: Health is the medicine of wealth. There is quite a lot of truth to that. Thank you doc! I believe so too. Haha, please laugh, it is funny really but I found I am never alone in the grabbing ‘second chance’ attitude and time seems to fly by so quickly. You have just raised another very important issue – food portion and in our case starch to stew/veg/meat ratio. What I have seen the western government doing is educating people constantly on the nutrition and what will happen if no attention is paid i.e high BP/diabese as example. What is most worrying sometimes is our people in diaspora, they have seen/heard and yet the type of food display on social media is soaked in oil and folks back home think that is the ‘way’ to go. In a country where we are on our own regarding health care, I agree the government need to educate people more of healthy eating using our local foods as well as exercise. I laughed as I read this even though it is a serious subject treated in the serious manner it calls for. I am particularly impressed that you shared with your readers your learning to swim as an adult, a fact that many would never want to share but the fact that most of us would never even dare learn to tackle swimming as adults. It is a very useful tool for life apart from the exercise it provides. Your observation of the creeping obesity in Nigeria, especially in urban areas, is right on. To make matters worse is the fact that most of our people do not realize the danger it poses while those who do seem to think it’s unimportant. 2. The importance of esting small portions. All one has to do is visit any of the zillions of weekend social events to see part of the reasons of the obesity in urban areas to people’s health as coming from the huge portions of food consumed. Worse, people are in denial over the quantity of food consumed: ah, bi ‘mi o jeun/ emi o kuku nje “much” … mo si n san ‘ra (ah, even if I do not eat/ah, I hardly eat but I’m still fat)! While our metabolism rates do differ, and while genes do play roles – according to experts – we are, for the most part, what and how we eat. I am no nutritionist – nor health expert but I recently contributed to someone losing 18 lbs in 5 months; walk 30 minutes daily 5 days a week; reduce your food intake – and see what health experts have preached for years. Pardon me, for the average urban area Nigerian, 50% of what they presently eat would suffice. The frying of food adds a lot to the health crisis. Even in the open markets, all the stews served on rice, spaghetti, et cetera are so fried that what I see is alarming. Our parents – at least when and where I grew up – did not fry their stews. The quantity of meat and meat products were also very sparse.